Nerd HQ. It has become my favourite thing about San Diego Comic Con these past few years. Run by the incredibly awesome (and multi-talented) Zachary Levi's Nerd Machine, it's the place to be! They raise money for Operation Smile which helps treat facial deformities in children. This year, thanks to the quick fingers of a great friend, I was able to attend the one panel (or Conversations for a Cause) I was determined to attend, one of the two Nathan Fillion panels. This year, Nerd HQ moved to Petco Park allowing for more space all whilst keeping everything in a much more intimate setting. You can watch all of the Conversations for a Cause, and I recommend doing so, they are brilliant, on the Nerd Machines' YouTube channel! The Nathan Fillion panel was moderated by his Firefly costar and ridiculously talented friend, Alan Tudyk! They were hilarious together, riffing off one another and sharing some awesome stories. Again, I encourage you to watch both panels. But, while waiting in line to enter the room where the panel would be held, I received a notice that Mr. Fillion would be doing Smiles for Smiles (photos with fans in their photo booth) after the second panel. My friend and I were in a conundrum. Either skip the panel to ensure we'd get a photo or try to find someone who'd stay in line for us. Thanks to an incredibly awesome friend who ran from the convention center to Nerd HQ and held a spot in line while we were in the panel, missing a signing she wanted to go to, we succeeded in getting photos with not only Mr. Fillion but a dual shot with Mr. Tudyk!!! I was in heaven. 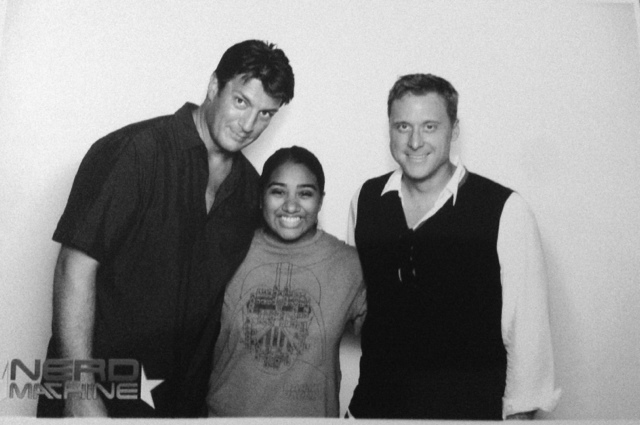 It's no secret I am a huge fan of mr. Fillion and after the last photo fail with him, this made up for everything. So a big shutout to Mr. Levi and all those running Nerd HQ this year and the past years. It's a highlight of SDCC for me time and time again!!! Follow me on twitter at @Corellianjedi2! New Agents of S.H.I.E.L.D. Poster!